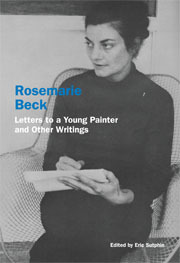 ROSEMARIE BECK (1923–2003) began her painting career in Woodstock, NY in 1946 as a second-generation Abstract Expressionist. In 1953, she had her first solo exhibition at the Peridot Gallery, and was included in the Stable Gallery Annuals of 1953, 1955 and 1956, “New Talent in the US” at the Martha Jackson Gallery (1956), “Nature Into Abstraction” at the Whitney Museum (1958) as well as other important exhibitions. She held teaching positions at Vassar College, Middlebury College, Parsons, Queens College and The New York Studio School. Public collections include the Whitney Museum of American Art, the Hirschhorn Museum, the Brooklyn Museum, the Hood Museum at Dartmouth College, the Neuberger Museum at SUNY Purchase, and the Corporation of Yaddo. Beck’s archive is stewarded by The Rosemarie Beck Foundation and her work is represented by Steven Harvey Fine Art Projects (New York, NY). ERIC SUTPHIN is a writer and painter based in New York. He is a frequent contributor to Art in America and has contributed to several exhibition catalogues and artist’s books. He has been a visiting critic at Rutgers University, The School of Visual Arts, Seton Hill University and Delaware College of Art and Design. Recent curatorial projects include “Two in a Room: Rosemarie Beck and Angela Dufresne” for SPRING/BREAK Art Show (New York, NY) and “Key Change” at AGENCY (Brooklyn, NY).